Breckenridge and surrounding Summit County abounds with recreation and entertainment opportunities all year round. In order to ensure that you get more time to enjoy these and your vacation home a townhouse can be a very good buy. In addition to being generally less expensive per square foot than a single family home, a townhome is a great alternative for those who don't want large outdoor space to landscape and maintain. Many Summit County townhouse homes come with the same amenities of a condo complex, but offer more privacy, land and square footage than a condo. Townhomes make sensational vacation homes! Maintenance and day-to-day landscaping are often taken care of by the property management company for you and all your neighbors, leaving residents free to enjoy the area when in town and without a care, when away. It's a win-win! Breckenridge is a beautiful small town with charming historic charm at the base of a world-class ski resort. Amid the 100-year old homes of the historic downtown are several newer townhomes, which keep it a family-friendly neighborhood. 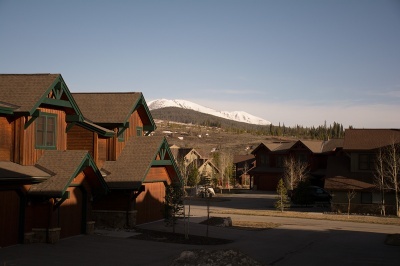 As you head up either side of the valley from the center of town, either toward the Breckenridge Ski Resort on the westside, or up Baldy Mountain to the east, several communities have small blocks of townhomes mostly built after 1980. The free transportation system around Breckenridge includes most Breckenridge townhouses downtown, all on the peak of Breckenridge and the free shuttle to the other Summit County ski resorts.